Below you fill find all funeral homes and cemeteries in or near Binghamton. Popular neighborhoods in Binghamton include: East Side, Southside, First Ward, West Side, Downtown Binghamton, North Side, and Binghamton Fire Department. Suburbs of Binghamton: Broadacres, Choconut Center, Conklin Forks, Dickinson, East Vestal, Glen Castle, Hawleyton, Hinmans Corners, Hospital, Kattelville, Nimmonsburg, Park Terrace, Port Dickinson, West Chenango, West Colesville, Westview. Binghamton is also known as: ounty / Binghamton city. Their current mayor is Mayor Richard C. David. Zip codes in the city: 13901, 13902, 13903, 13904, 13905. There are currently 24 funeral options for this city. Binghamton has been featured in films like: Liebestraum (1991). Some of the notable people born here have been: Douglas H. Wheelock (astronaut), Bridget Moynahan (model and actor), Marc Benioff (businessperson), , Chris Wedge (film producer and film director), Richard A. Baker (actor and film producer), Jon Kimmel (american football player), and Olivia S. Direnzo (illustrator and homemaker). Binghamton is home to the following sports teams: Binghamton Rangers, Binghamton Whalers, and Binghamton Dusters. Binghamton /ˈbɪŋəmtən/ is a city in, and the county seat of, Broome County, New York, United States. It lies in the state's Southern Tier region near the Pennsylvania border, in a bowl-shaped valley at the confluence of the Susquehanna and Chenango Rivers. 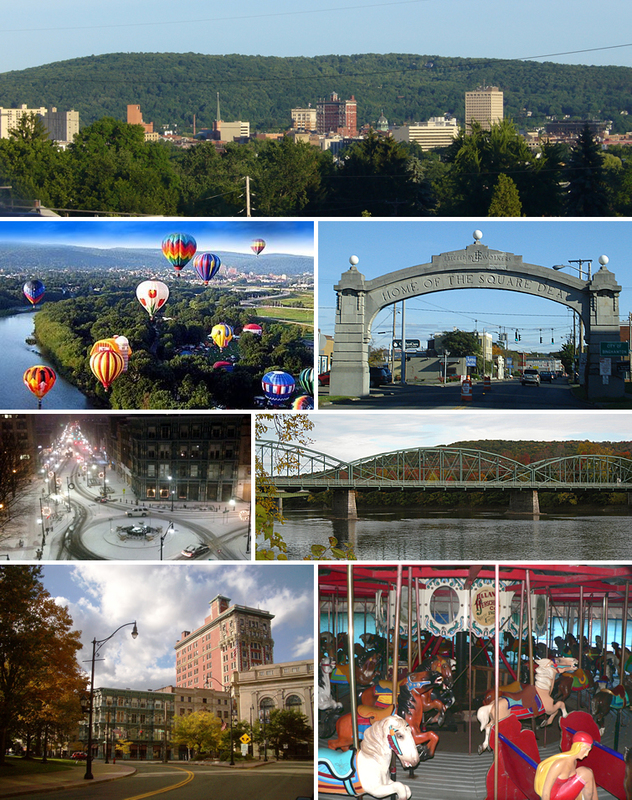 Binghamton is the principal city and cultural center of the Binghamton metropolitan area (also known as Greater Binghamton, or historically the Triple Cities), home to a quarter million people. The population of the city itself, according to the 2010 census, is 47,376.From the days of the railroad, Binghamton was a transportation crossroads and a manufacturing center, and has been known at different times for the production of cigars, shoes, and computers. IBM was founded nearby, and the flight simulator was invented in the city, leading to a notable concentration of electronics- and defense-oriented firms. This sustained economic prosperity earned Binghamton the moniker of the Valley of Opportunity. However, following cuts made by defense firms after the end of the Cold War, the region has lost a significant portion of its manufacturing industry.Today, while there is a continued concentration of high-tech firms, Binghamton is emerging as a healthcare- and education-focused city, with the presence of Binghamton University acting as much of the driving force behind this revitalization. It was noted by Sarasota Herald-Tribune on March 29th, 2019 that Lynn Talbot died in Sarasota, Florida. Talbot was 85 years old and was born in Binghamton, NY. Send flowers to express your sympathy and honor Lynn's life. It was disclosed by Cortland Standard on March 18th, 2019 that John D Evans died in Binghamton, New York. Evans was 64 years old. Send flowers to share your condolences and honor John D's life. It was revealed by Cortland Standard on February 20th, 2019 that Delores T "Dee" Tower (Lewis) died in Binghamton, New York. Ms. Tower was 82 years old. Send flowers to express your sympathy and honor Delores T "Dee"'s life. It was written by South West Times Record on January 20th, 2019 that Lucille Rose Wilbur (Brown) passed on in Ft Smith, Arkansas. Ms. Wilbur was 75 years old and was born in Binghamton, NY. Send flowers to express your sympathy and honor Lucille Rose's life. It was revealed by News & Observer on December 22nd, 2018 that Arnold Frederick Wischhusen passed away in Raleigh, North Carolina. Wischhusen was 88 years old and was born in Binghamton, NY. Send flowers to express your sorrow and honor Arnold Frederick's life. It was reported by News & Observer on December 14th, 2018 that Barbara Lorraine Leinbach died in Cary, North Carolina. Leinbach was 78 years old and was born in Binghamton, NY. Send flowers to share your condolences and honor Barbara Lorraine's life. It was noted by Hartford Courant on November 13th, 2018 that Mary Elizabeth Sullivan (Crull) passed away in West Hartford, Connecticut. Ms. Sullivan was 83 years old and was born in Binghamton, NY. Send flowers to share your condolences and honor Mary Elizabeth's life. It was disclosed by New Haven Register on October 23rd, 2018 that Joyce O'Dea (McDonald) passed on in Wallingford, Connecticut. Ms. O'Dea was 94 years old and was born in Binghamton, NY. Send flowers to express your sympathy and honor Joyce's life. It was written by Peoria Journal Star on October 17th, 2018 that Bruce M Colley passed away in Peoria, Illinois. Colley was 75 years old and was born in Binghamton, NY. Send flowers to express your sorrow and honor Bruce M's life. It was disclosed by Sarasota Herald-Tribune on October 6th, 2018 that Kathleen Ann Corrigan (Dring) passed away in Sarasota, Florida. Ms. Corrigan was 66 years old and was born in Binghamton, NY. Send flowers to express your sorrow and honor Kathleen Ann's life. Binghamton is a Administrative divisions of New York#City located in the Southern Tier of New York in the United States. Before that, the first known people of European descent to come to the area were the troops of Gen. The community was first settled around 1802 and was known as "Chenango Point." Binghamton was first incorporated in 1834 as a village of the Binghamton (town), New York of Binghamton. John Avenue to the east) is known as the Abel Bennett Tract. On Feb. The official website for the city of Binghamton is http://www.binghamton-ny.gov. Family and friends are invited to call on Sunday, Nov. 7 from 1 to 3 p.m. at the James D. Barrett Funeral Home, 1004 Lake St., Elmira, NY. Funeral services will follow there at 3 p.m. with Rev. William Wells officiating. Find a Funeral Home inBinghamton, New York NY to provide the caring burial and ceremonial services your family deserves. We work with local florists and flower shops to offer same day delivery. You will find budget sympathy flowers in Binghamton here. Our funeral flowers are cheap in price but not in value.